Entry-level managers respond “no” so as not to be seen as overconfident by upper management. As you might imagine, strictly using someone’s title to determine their strategic ability is as accurate as using a Hollywood star’s popularity to determine their knowledge of political issues. I’ve heard entry-level managers in strategy development meetings synthesize several customer and competitor facts to come up with brilliant insights leading to successful strategies. I’ve also heard a senior level executive running a multi-billion dollar business say that their strategy was to be different, which is akin to saying that they like their water wet. So if title and experience are not definitive measures of one’s strategic thinking skills, then what is? The answer to the question “Are you Strategic?” isn’t nearly as important as the follow up question: How do you know? 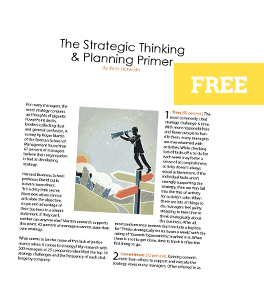 How do you really know if you or your fellow managers have the strategic thinking skills required to take your business to the next level?